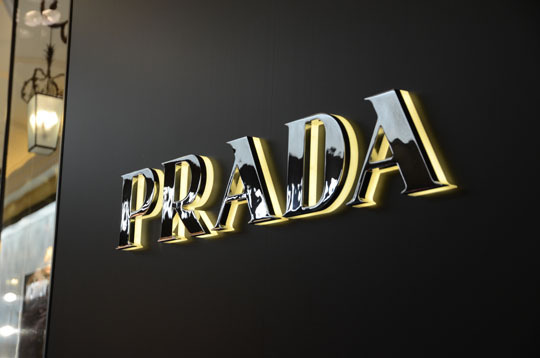 Some time ago, a PRADA stores in Hong Kong told us that their store sign installed two years ago from another sign manufacturer appeared to have serious corrosion of the mirror’s stainless steel and asked whether if we can provide better quality signs for their new store. We sent our technician to this store for on-site investigation, from site condition point of view, it was a quite serious corrosion of stainless steel, it has completely destroyed the mirror effect. After store’s approval, we took down a letter back to our factory for analysis. In the meaning time, we have two findings; first, the store is relatively near the sea, and the second may be the installation position is not high enough; as there is lot of human hand prints on the sign site. After further inspection, we found that in fact this sign’s production process is still very good, but it was made by 304 stainless steel. Because 304 stainless steel is made out of a relatively soft metal, it is easily bent into a desired shape, so it is widely used in sign production. However, the corrosion resistance of 304 stainless steel is not strong, especially in some areas easily accessible to acid or alkali. This PRADA store is near the sea which the environment itself is relatively easy to cause corrosion, coupled with the installation location, which is too low and is easily touched by visitors, the hand’s sweat will be left on the surface of the stainless steel and increase the corrosion. Finally, we provided this PRADA store with signs using 316L stainless steel. 316L stainless steel corrosion resistance is very good, but the material is very hard, it needs better processing equipment and experienced technicians to be bent into a desired shape. Therefore, only a few manufacturers can provide Fabricated Signs using 316L stainless steel. We are proud to be one of those few factories. Of course, the customer is very satisfied with this new signs. We also recommend to the customers that it is better to maintain the signs by cleaning regularly, in fact, very simple, use soft cloth with distilled water to wipe it. 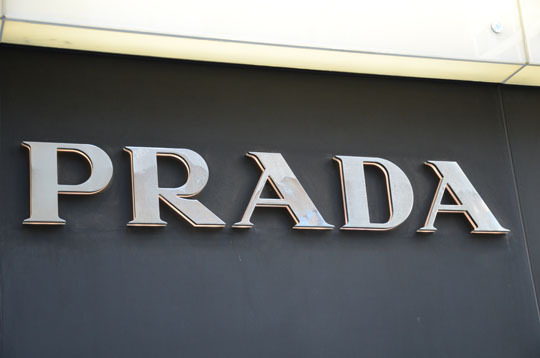 We are very pleased to be able to provide with signs that PRADA store needs. At the same time, through this case, it give us a very important reminder that it is better to check with the client’s installation location before production, which takes full account of the factors that may cause corrosion in order to provide the most suitable material for the sign’s production to meet customer needs.